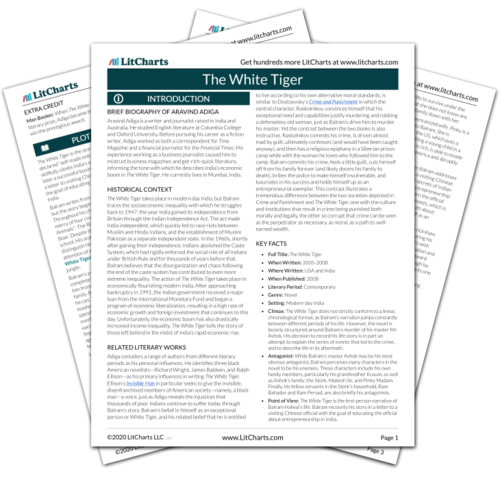 Instant downloads of all 946 LitChart PDFs (including The White Tiger). The driver of another wealthy businessman who lives in Ashok’s apartment complex. He has Vitiligo, a common, disfiguring skin disease that primarily afflicts India’s poor. Vitiligo-Lips takes a liking to Balram and attempts to help him adjust to Delhi. At first, his mentorship takes the form of supplying Balram with murder magazines and answering Balram’s questions about city life. Later in the novel, Vitiligo-Lips helps Balram procure a prostitute and begin to cheat Mr. Ashok out of his money. ). Note: all page numbers and citation info for the quotes below refer to the Free Press edition of The White Tiger published in 2008. The timeline below shows where the character Vitiligo-Lips appears in The White Tiger. The colored dots and icons indicate which themes are associated with that appearance. Scopa, Sally. "The White Tiger Characters: Vitiligo-Lips." LitCharts. LitCharts LLC, 17 Jun 2015. Web. 24 Apr 2019. Scopa, Sally. "The White Tiger Characters: Vitiligo-Lips." LitCharts LLC, June 17, 2015. 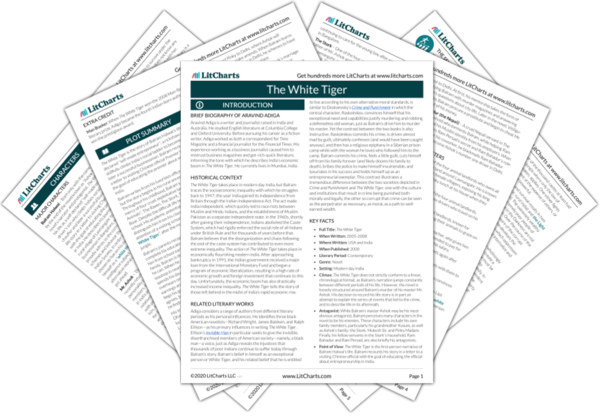 Retrieved April 24, 2019. https://www.litcharts.com/lit/the-white-tiger/characters/vitiligo-lips.